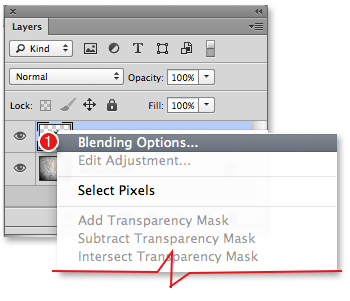 The blending mode that you choose for a tool or layer affects how that tool or layer interacts with underlying pixels. To produce a blending mode effect, Photoshop compares colors in one of the following ways: It compares the colors of two layers on a channel-by-channel basis, it compares each color in a layer to a corresponding color in the underlying layer (the base color), or it compares the paint color being applied by a tool to the existing color in the layer. You can choose from a menu of blending modes, in many locations in Photoshop, such as the Options bar (for most painting and editing tools), the Layers panel, the Layer Style and Fill dialogs, and the Blending Options dialog for a Smart Filter. In order for you to see the results of a blending mode choice for a layer, its contents must overlap some contents of the underlying layer. When choosing an Opacity percentage for a tool (via the Options bar). keep in mind that the tool results will also be affected by the opacity of the layer that you edit. For example, strokes applied with the Brush tool at an Opacity setting of 50% on a layer that has an Opacity setting of 50% will appear lighter than the same strokes if applied to a layer that has an Opacity setting of 100%. 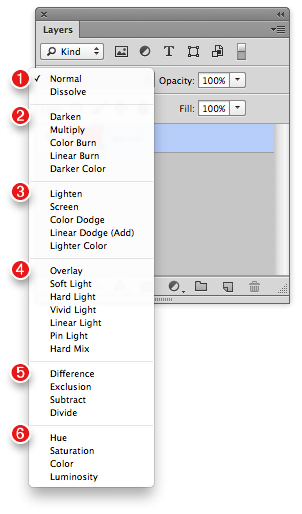 Blending modes are grouped in categories on the menu, based on their function and effect. The (1) Basic blending modes replace the base colors. The (2) Darken blending modes darken the base colors. The (3) Lighten blending modes lighten the base colors. The (4) Contrast blending modes change the amount of contrast. The (5) Comparative blending modes invert the base colors. The (6) Component blending modes apply a specific color component. 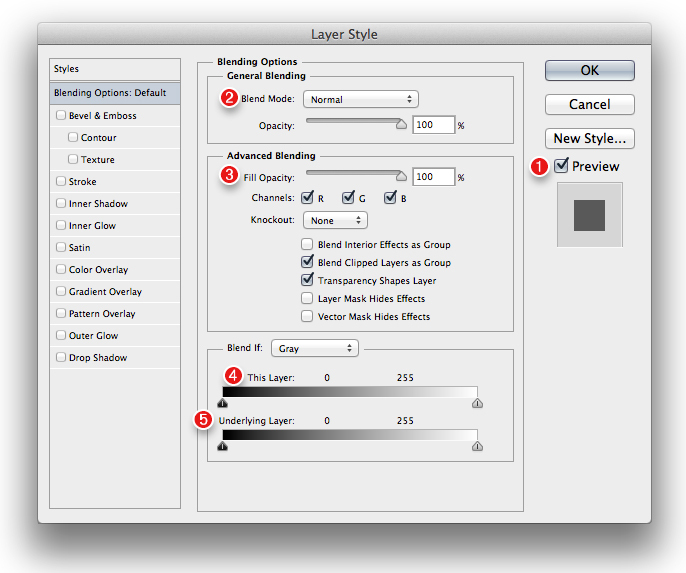 The Advanced Blending options in the Layer Style dialog let you control how a layer blends with underlying layers. Here we focus on the Blend If sliders. 1. 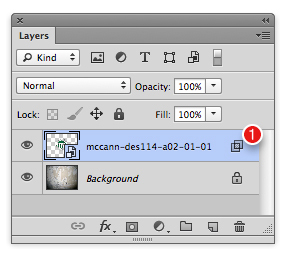 Double-click next to the name of a layer or layer group on the Layers panel. 2. The Layer Style dialog opens (Blending Options should be selected in the upper left). Check Preview. The first three controls – Blend Mode, Opacity, and Fill Opacity – are the same as on the Layers panel. (The Fill Opacity changes the layer opacity without altering the opacity of any layer effects. 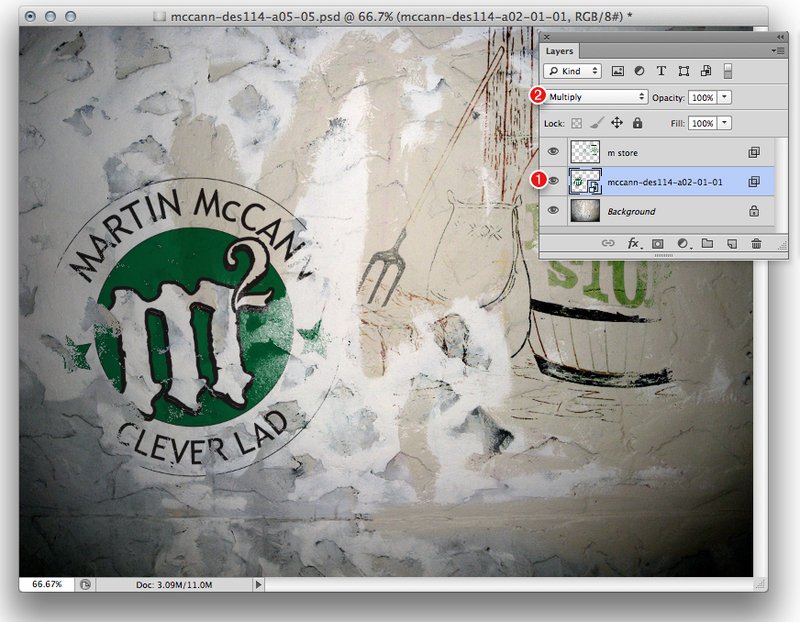 Move the black This Layer slider to the right to drop out shadow areas from the current layer. Move the white This Layer slider to the left to drop out highlight areas from the current layer. Move the black Underlying Layer slider to the right to reveal shadow areas from the underlying layer. 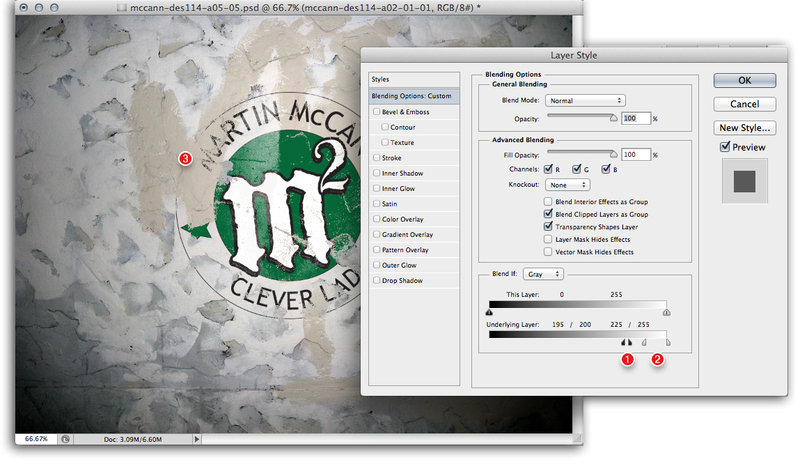 Move the white Underlying Layer slider to the left to reveal highlight areas from the underlying layer. To adjust mid-tone colors separately from the lightest and darkest colors, Alt-drag/Option-drag a slider (it will divide into two sections), then drag each half of the slider separately. 4. Click OK. On the Layers panel, the layer will show this (1) symbol indicating that the Advanced Blending modes currently have non-default settings. To display only layers that contain non-default Advanced Blending settings, choose Attribute from the Filter Type menu on the Layers panel, and Advanced Blending from the second menu. We opened a photo of a surface texture, then placed our week 02 Logo. 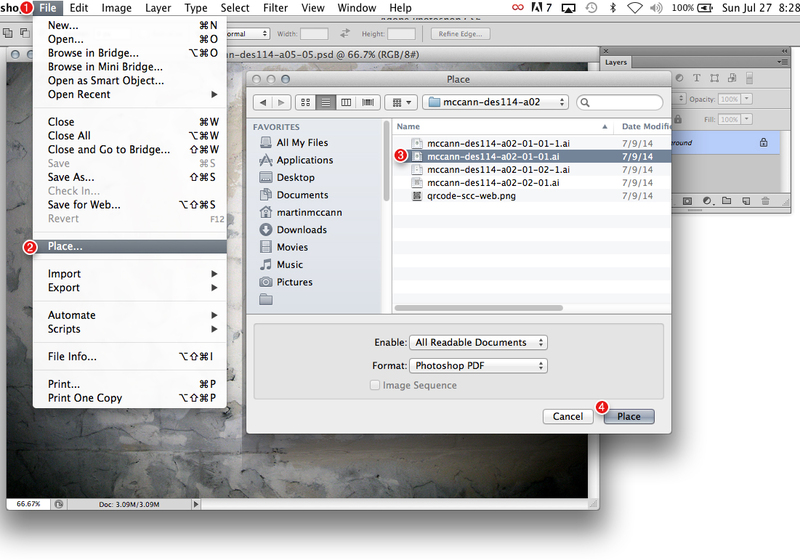 From the top menu File>Place…. In the Place dialog box navigate to the image of choice. Select Place. We double-clicked the logo layer name to open the Layer Style dialog. In the Blend If area of the Layer Style dialog, we dragged the black (1) Underlying Layer slider to the far right. Dark colors from the texture layer now show through the logo layer. 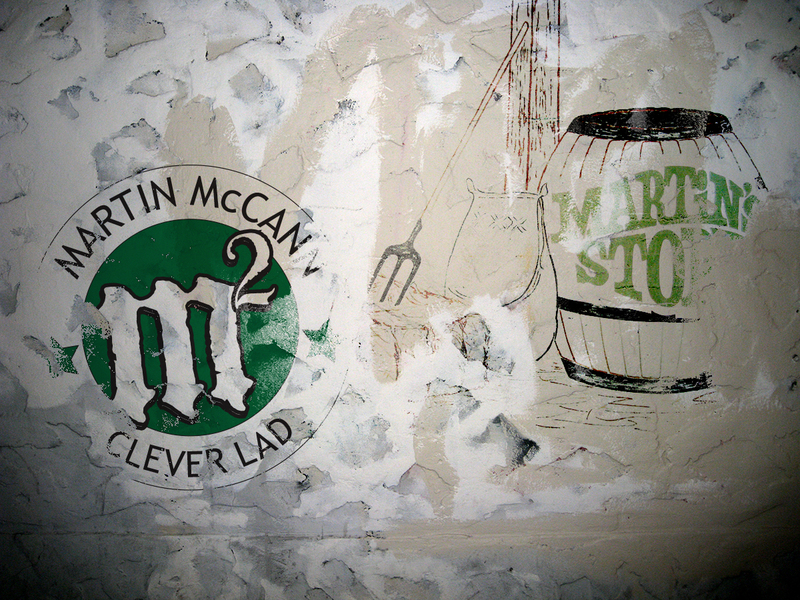 I repositioned and re-adjusted the (1) Logo layer then set the blending mode to (2) Multiply. And then added another graphic element.